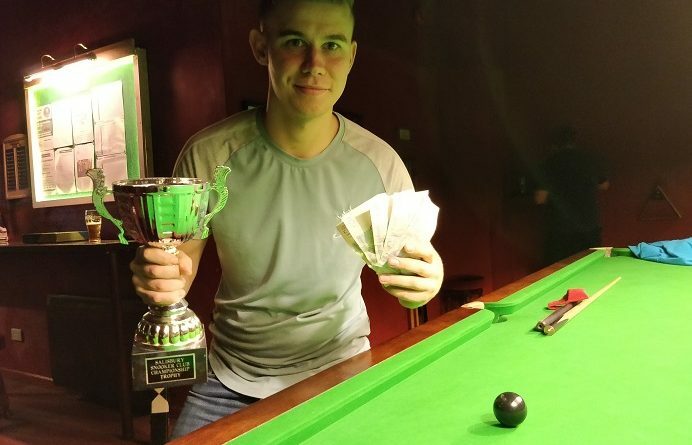 ACCOMPLISHED pool player Adam Guyatt pocketed the £100 first prize in his once-a-year snooker tournament. Guyatt regained the Club Championship title at Salisbury Snooker Club which he first won in 2016. Despite only turning to snooker a few days before the annual event, he dropped just one frame all day and defeated Jake Stewart 2-0 in the final. Guyatt knocked out defending champion John Hunter 2-1 in the last-four. And in the previous round, he complied breaks of 76 and 52 in two frames against Neil Herd. GROUP A: 1st, John Hunter; 2nd, Paul Burt; 3rd, Lee Stagg; 4th, Antony Foxcroft; 5th, Eddie Mason. GROUP B: 1st, Jake Stewart; 2nd, Neil Herd; 3rd, Jimmy Johnson; 4th, Rich McEvoy; 5th, Thomas McEvoy. GROUP C: 1st, Anthony Rice; 2nd, David Rice; 3rd, Steve Ashton; 4th, Stuart Dreyer; 5th, David Smith. GROUP D: 1st, Adam Guyatt; 2nd, Andy Cooper; 3rd, Richard Arnold; joint 4th, Ally Pollard and Will Kempson. QUARTER-FINALS: Hunter 2-0 D Rice, Guyatt 2-0 Herd, Stewart 2-0 Cooper, A Rice 2-0 Burt. SEMI-FINALS (£25): Guyatt 2-1 Hunter, Stewart 2-1 A Rice. FINAL (£100/£50): Guyatt 2-0 Stewart.